TSPSC Group II Results 2016– 17: Telangana Public Service Commission (TSPSC) has conducted the Group II Examination on 11th and 13th Nov 2016 cross the state of Telangana. 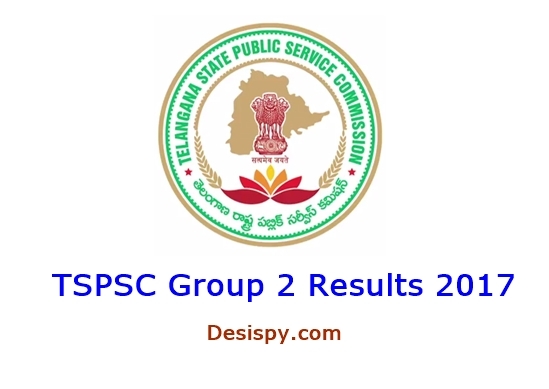 The Telangana PSC declared the results on June 2nd at its official website, tspsc.gov.in. Hence all the aspirants attempted the examination can check their TSPSC Group 2 results 2017, cutoff marks, Qualified/ Selected candidates list from the official website. Check more details from the following article. TSPSC Group 2 Results 2016, Cutoff Marks, Merit List for final Interview : The Telangana Public Service Commission has released a notification for1032 various vacancies. The TSPSC has advertised various posts of Prohibition & Excise Sub Inspector (SI): 284 posts, Deputy MRO: 259 posts, Municipal Commissioner: 19 posts, GAD Assistant Section Officer: 90 posts, Assistant Commercial Tax Officer: 156 posts, Panchayat Raj Extension Officer: 67 posts, Grade 1 Executive Officer (Endowment): 11 posts, Assistant Register: 62 posts, Finance Dept Section Officer: 28 posts, Assistant Development Officer ( Handlooms & Textiles): 20 posts, Assistant Labour Officer: 03 posts, Law Dept Section Officer: 10 posts, Assistant Section Officer (Finance Dept): 28 posts, Assistant Section Officer (Law Department): 10 posts. The TSPSC has announced the TSPSC Group 2 notification in the month of September 2016. 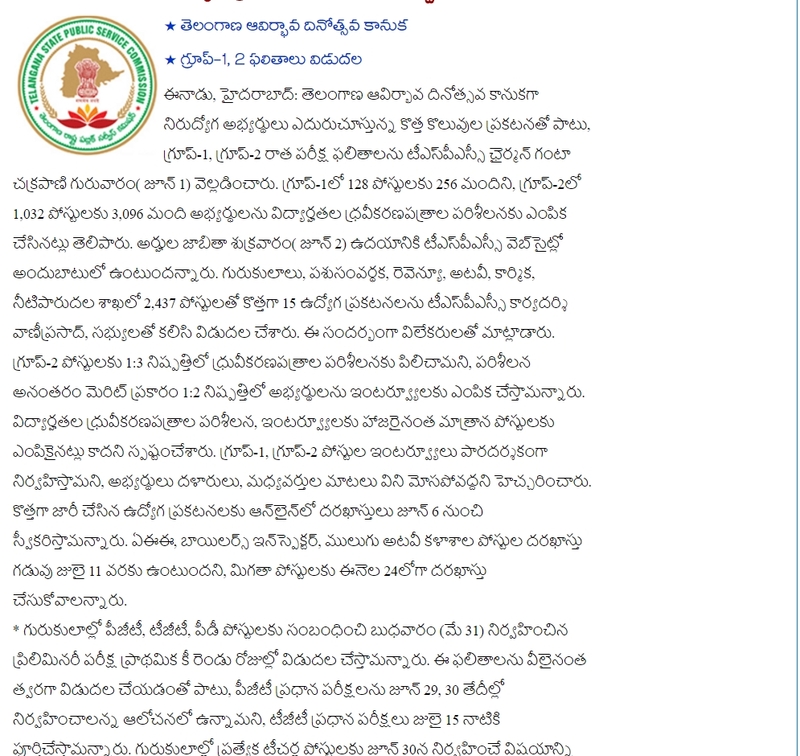 Many of the candidates interested in Telangana Government jobs have applied for the TSPSC Group 2 vacancies. The applicants have appeared for the examination on 11th and 13th November in various examination centres. Hopefuls also have checked the answer key from the official website, tspsc.gov.in and now they are keen to know their results. The TSPSC released the results and cutoff marks on its official website on June 1st, 2017. the Official result and provisional selected candidates list available now from June 2nd in its official website. How to Check TSPSC Group II Result 2017 Online Name wise? Now, in the home page of the website, check for the TSPSC Group 2 Results 2017 and then open the link. Now click on submit to submit those details. Finally, your TSPSC Group II Result, Score card will be displayed on the screen. The TsPSC announced the TSPSC Result, Cutoff Marks 2017 on June 2nd eve of telangana formation day. Hence candidates those have appeared for the examination on 11th and 13th November 2016 can stay checking the TsPSC Portal, tspsc.gov.in to download the result and cutoff marks. Also the TSPSC Announced TSPSC Group 2 merit list 2017 while at the announcement of results. Hence candidates can go through the information from the TSPSC official website. Hai,when was the result come. group2 list lo select ayina vallam manam kuda justice kosam fight cheyali asalu epudu ki solve avutadi issue. nobody is responding. 2. e notification recruitment jaruguthunda leda ? 3. 1:2 list epudu pedtharu? and gave 3 weeks time to govt to file counter affidavit about the bubbling/jumbling answers etc. Thanks to the guys who went to court and for their efforts to find the facts. so overall process it seems suspicious. Please be alert in these modern days and where media is powerful. Group 2 ani 2 years time waste chesamu… Whitners use chesi na vallu… Number diddina vallanu kuda consider chesaru annaka… Tspsc meeda impression poyindi… Time pass cheyataniki…. Pettaru group 2…. What about marks.where is merit list.